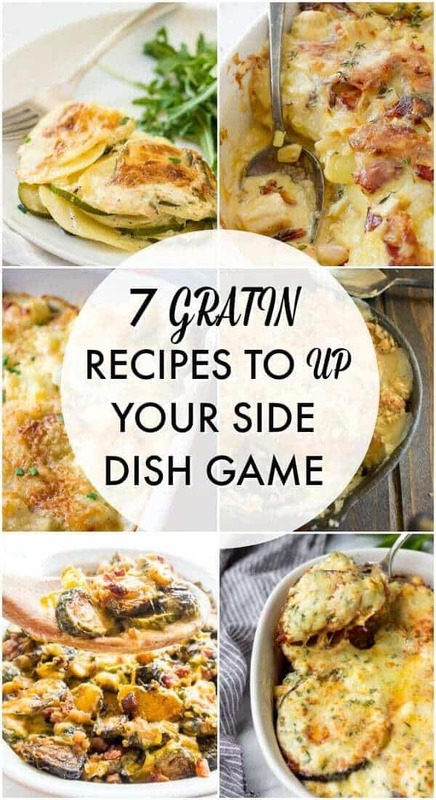 Whether you’re preparing a Sunday night dinner and looking for easy yet delicious side dish your whole family will love, or planning a special holiday menu, make sure to put one of these Gratin recipes on your list. Fancy but easy French casserole with a crispy top that is sure to become a regular player on your dinner table. Be sure to sign up for my email…and get a free e-cookbook! I love Gratins. If you’ve been following my blog, you know I went a little overboard with posting new gratin recipes. Not that I don’t other side dishes, I just love my veggies with a little cheese on top. And preferably crunchy and warm too. Another reason why I’m sharing this round-up with you is that gratin recipes have been extremely popular on my website. Just like me, my readers love good French vegetable bake. What’s not to love? It’s warm, creamy, flavorful and amazingly comforting. Traditionally, Gratin is cooked in a shallow casserole/gratin dish which is where it is also served. 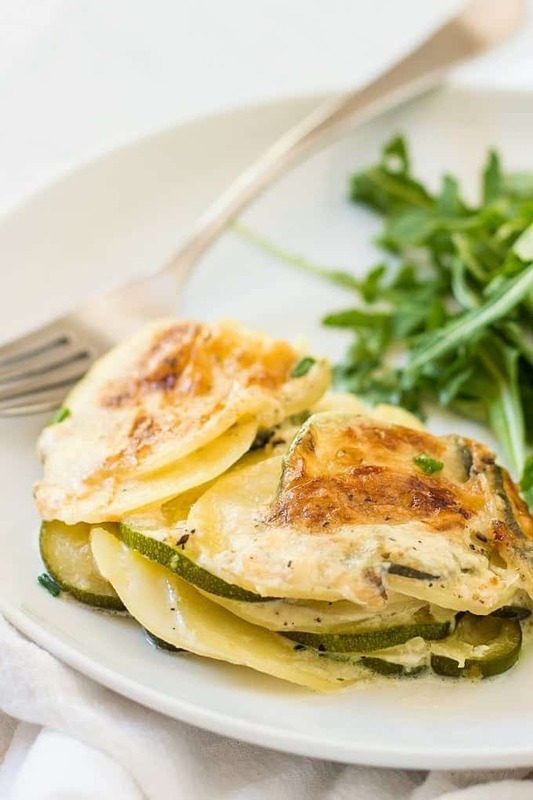 Gratin is usually made as a side dish however there are ways to make it as a main dish. Several of my vegetarian Gratin recipes (see below) are so filling that all you need is a salad on the side. Enjoy my favorite Gratin recipes round up and make sure to include them in your weeknight or holiday menu. Don’t forget to sign up for my email…and get a free e-cookbook! Low carb eggplant recipe that makes a terrific side dish. I first made it for my husband’t birthday and he liked it so much. 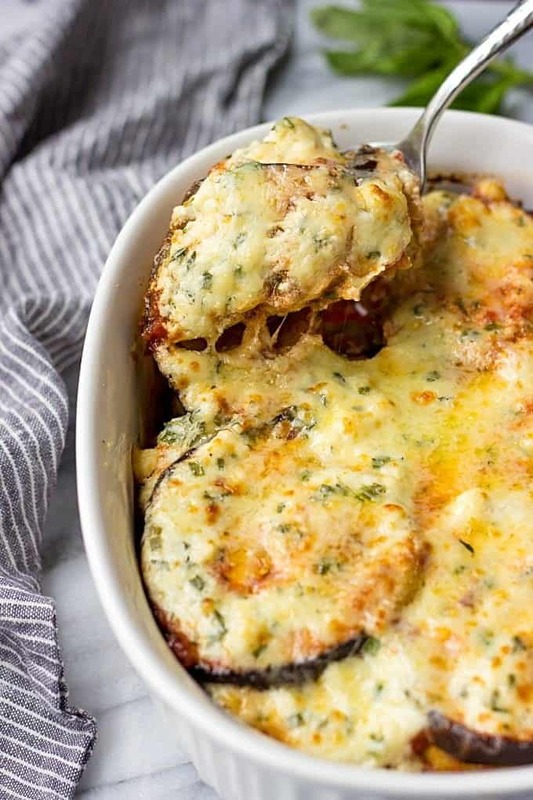 Now, whenever I make this easy Eggplant Gratin, it’s always a winner! Perfect way to use utilise eggplants. Creamy, cheesy, filling and everyone like it. 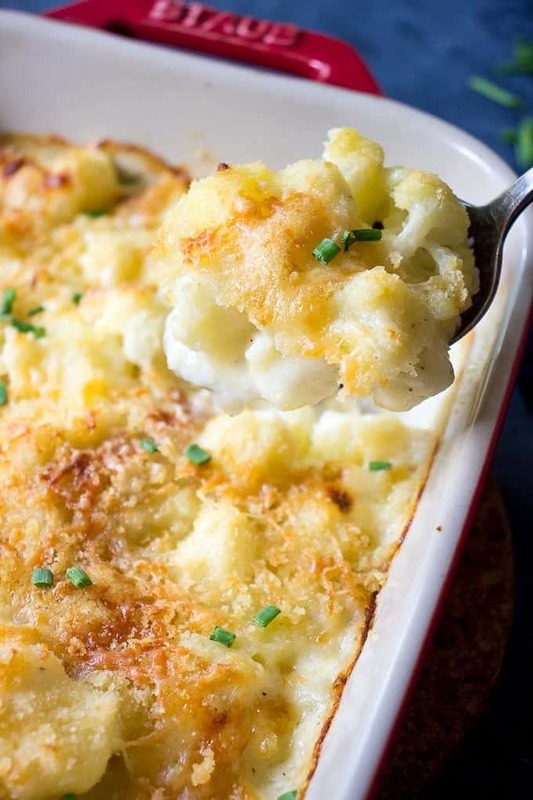 This recipe is inspired by famous Ina Garten Cauliflower Gratin. My introduction to Gratins started exactly with this recipe and from the first moment that I tried it, I knew it was gonna be on repeat in my house. I added potatoes to make this Cauliflower Bake extra filling and delicious, but you’re welcome to use just cauliflower. 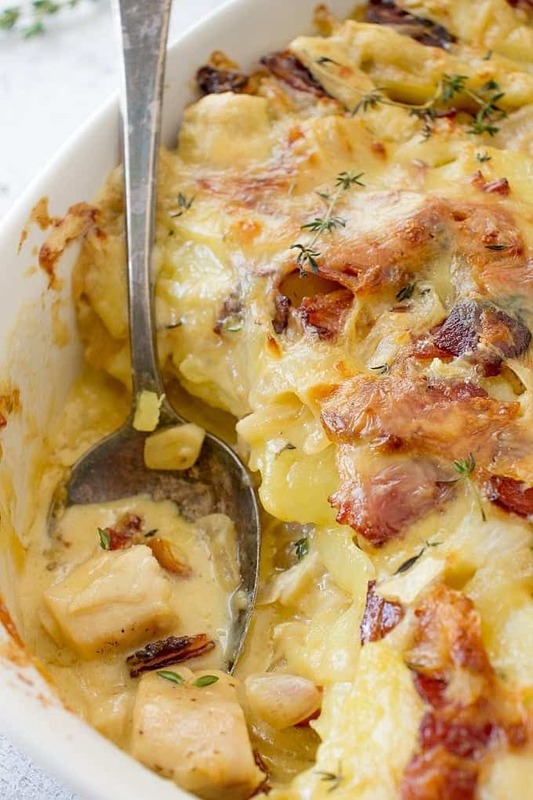 I seriously fell in love with this traditional recipe form French region of Savoy. Combination of double cream Brie with crispy bacon and potatoes produce an ultra comforting dish perfect for family meal in the cold winter days. Although this side dish requires a few dirty pans but the end result is so worths it! Give it a try! Especially easy and quick to put together side Potato Bake that requires only 6 ingredients and goes with everything! Main flavor enhancers are garlic and Herbs De Provence. If you don’t have the latter, simply use any combination of dry herbs that you have in your pantry. Low carb, Gluten-Free and only 9 Ingredients! 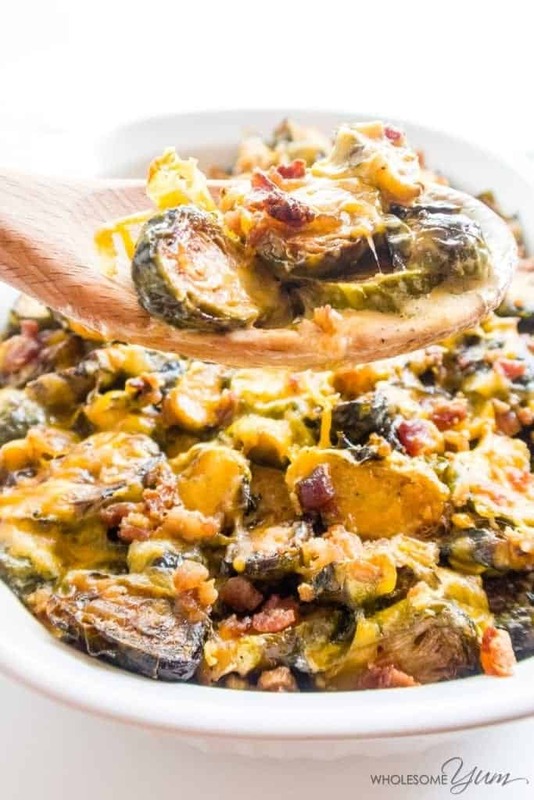 If you hate Brussels Sprouts, you’ve got to try the incredibly delicious Cheddar sauce. It’s seriously so good, you’ll be hooked! Great side dish for Thanksgiving or Christmas! You can make this recipe as a side dish or a main dish. Sweet Butternut Squash, Fontina, Parmesan and crispy Panko breadcrumbs produce one filling and flavorful dish. Great for fall-winter holidays, this easy recipe will be a hit with any crowd! Now it’s your turn. Give these delicious recipes a try and let me know what you think! They all look so good. 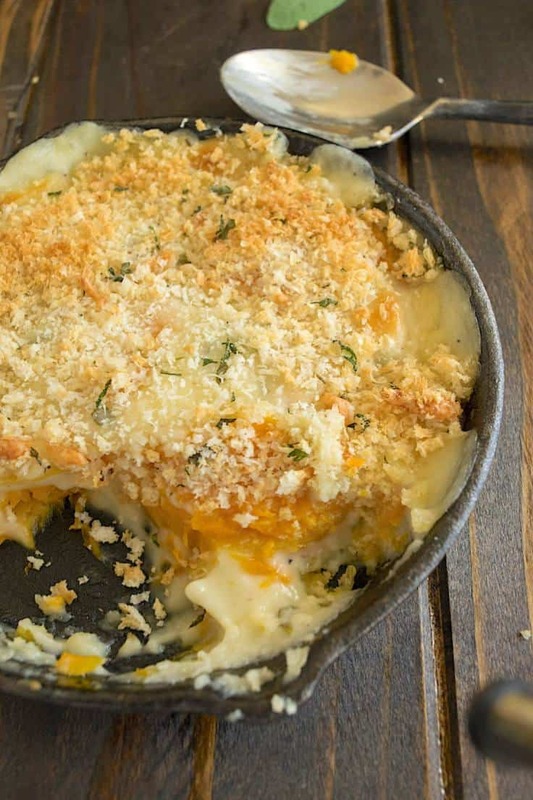 Thank you for including my butternut squash sage gratin.